At one time, orangutans were found all over Southeast Asia, where they made their homes at the top of trees in the rainforest. Hundreds of thousands of them lived there for thousands of years. Now, however, you can only find them on the Indonesian islands of Sumatra and Borneo. Their population has also decreased to around 60,000 — way less than before. So where have all the orangutans gone? Most have been removed from their homes due to humans harming the rainforests in which they live. Many of the forests have been cut or burned down to make room for palm oil plantations, mining and logging. Even still, there are many people and organizations that are doing their best to make sure that the orangutans don’t go extinct. Keep reading for ways that you can help. 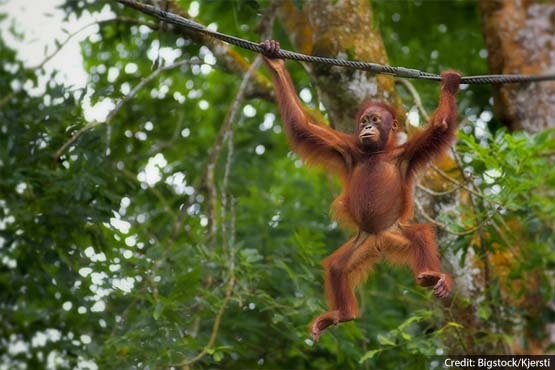 Going green is one of the easiest ways to help save the orangutans. Recycle your papers and notebooks when you’re finished with them, and try to buy items that use recycled paper. Another easy way to help is to bring recyclable bags to the grocery store instead of using paper or plastic. When trees in the rainforest are cut down, many of them are processed and turned into other products like furniture and household items. The demand for real wood means that millions of trees are destroyed every year. Ask your family not to buy things made from rainforest wood like mahogany, teak, rosewood and zebrawood. A major way to help save the orangutans is to stop buying products that contain palm oil. Every hour, the land of rainforest lost is enough fill 300 soccer fields. That land is then used for palm oil farms, leaving the orangutans and many other animals homeless. Palm oil is found in some brands of peanut butter, cookies, soaps and shampoos, and the only way to avoid these brands is to read the ingredients labels on the package before making a purchase (you can see the different names used to disguise palm oil here). By doing this, you can encourage corporations to avoid using palm oil in their products — or to switch to sustainable palm oil. In some countries, brands using sustainable palm oil are including on their packaging a special stamp by the Roundtable on Sustainable Palm Oil, a non-profit organization aimed to make sure the products you’re buying are as environmentally-friendly as possible. Most people have no idea just how bad things are for the orangutans. You can help by spreading the word to your family and friends, by sharing information about what’s going on in Indonesia through videos like the one below or using the hashtag #InYourPalm on social media. There are also several online campaigns that are encouraging people to get in touch with companies and encourage them to stop destroying the rainforests and stop using palm oil in their products. Should Cops Be Required to Wear Body Cameras on the Job? Very sad. Apes need our help! I like it when monkeys have babies. Save them, help them, don’t cut down the forest, and stop messing with them. They should have cameras and body guards guarding them, mostly during the night. If someone does not believe them then they have proof on camera. So to answer your question I believe cops should wear body cameras. Yes, because people would be able to see everything they did to the person they arrested. Yes, because we need to know what cops do exactly.